It’s not our imagination. The wheat we eat today has been tampered with by science. Grain that had been at the heart of humankind’s diet for thousands of years is no longer the food our ancestors ate. In 1971 Big Agriculture stepped in and crossed ancient wheat with non wheat grasses using gamma rays and xrays. The introduction of altogether new genes created a mutation of the wheat seed. The result was a high yielding variety of wheat that is 75% starch (which turns to blood sugar within minutes in the body). Hijacking our wheat has been devastating for a population that has been depending on this food since biblical times when flat breads were dried on warm stones in the desert. I believe, in the early days, scientific technology did not truly realize the nutritional havoc they had created. The intention had been to create higher yielding wheat that would address world hunger. But here’s the scam. It is now understood that the bastardized wheat is causing massive health problems. Yet there is no intention to call it a scientific experiment gone bad. Quite the opposite. As more and more people get sick, it has presented a grand opportunity to make billions off selling medications to sick people. DIABETES AND OBESITY: The gliadin protein of wheat gluten is probably something you never felt you had to consider. During the manipulation of the wheat embryo, the gliadin protein went through Frankenstein changes. The new gliadin became an appetite stimulate. The appetite stimulating properties of modern wheat most likely occurred as an accidental by-product of largely unregulated plant breeding. But once science discovered what they did, they knew they’d fallen on a gold mine. Gliadin protein binds to the opiate receptors in the human brain, triggering appetite and addictive eating behaviors. This makes it very difficult to pass up the biscuits and gravy or stop eating pizza or pasta way past when we’re full. This applies to every food that contains wheat. Now that the modern food industry better understands gliadin in the last 15 years it is showing up in processed foods like candy, lunch meats, Bloody Mary mix and wine coolers…… Wheat gliadin manipulation is linked to the high rise of obesity and the 29 million suffers of Diabetes in America. CELIAC DISEASE: Among the wheat-related pathologies, Celiac Disease is the best known. It’s a serious condition that effects 1 in 133 people. 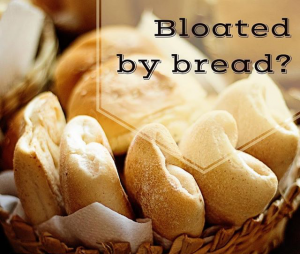 Also known as gluten sensitivity, Celiac Disease is a serious autoimmune disorder. When people with Celiac Disease eat gluten, their bodies mount an immune response that attacks the the small intestine. These attacks lead to damage of the villi, small finger like projections that line the small intestine, which promote nutrient absorption. In time there is breakdown in the intestinal lining allowing various components of wheat to gain entry into the bloodstream. It’s not easy to diagnose Celiac Disease. It expresses itself in slippery ways. “While 50 percent will experience cramping, diarrhea and weight loss, the other half may suffer from depression, or chronic fatigue. In others, it may cause no symptoms whatsoever but show up later in life as neurological impairment, incontinence, dementia or gastrointestinal cancer”, says William Davis, MD, author of “Wheat Belly”. “WELL CAN I EAT GLUTEN-FREE BREAD?”, you may ask. In a perfect world gluten free food companies should be focused on creating breads that help those with major health issues caused by gluten exposure. But it’s not good news. Gluten-free flour often consists of cornstarch, rice-starch and tapioca-starch, which raises blood sugar even more then wheat. And wheat elevates blood sugar more than table sugar. These substitute flours don’t rise well. So Dow Chemical recently invented “Wellnence Gluten Free 47129”, with polymers derived from cellulose and carcinogenic chemicals that mimic gluten in bread products. Dow doesn’t like to call it’s new invention ‘chemically modified wood pulp’, so it is marketed as ‘plant based food ingredients’ or ‘natural plant fibers’. Presently there is no limit on the amount of chemically modified cellulose pulp that can be used in bake goods. Chances are, right now, if you are eating gluten free breads, pancakes, crackers, pizza crust or muffins, you are consuming wood pulp with a dash of pesticides. Humans, unlike termites don’t get along well on cellulose. This is a corporate processed food to make money off sickness from modern wheat and does not have our precious health in mind. “The Gluten Free Food Industry is profiting to the tune of 3.4 billion dollars a year with an expected growth to reach 24 billion dollars by 2020”, reports the Gluten Free Society. Corporations are in the money making business, not the health business. They are not our friends. So if new modern wheat has become a food source we can longer trust to support life, what can we do? 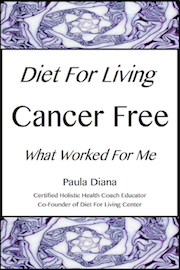 Take our Diet For Living School “Certified Holistic Health Coach Program”. We teach you to make crackers, breads, pancakes and desserts out of organic whole food flours made from almonds, coconut, flax seed and, our favorite, Raw Kasha, a 4000 year old flower seed soaked overnight and made into a dough. The present food problems require that we find a new way to be in the world. It is what we will pass on to our children and their children. I believe it’s worth every effort.